The Digital Diagnostic Imaging Skills Laboratory was opened in January 2014 by the Vice Chancellor of LSBU, Prof. David Phoenix. The facility was built in the landmark building K2, which houses a suite of sophisticated skills laboratories for health and social care students. Fujifilm was the chosen provider. Fujifilm is a pioneer in diagnostic imaging and information systems for healthcare facilities, with a range of constantly evolving clinically proven products and technologies designed to assist medical professionals perform more efficiently and effectively. Prof. Phoenix remarked, "The on-going partnership with Fujifilm has the potential to provide a range of research and enterprise opportunities of benefit to our staff and students as well as service users." The ongoing working partnership between Fujifilm and LSBU was also a key factor in the University's decision to install D-EVO Suite. D-EVO Suite has a ceiling support which is ergonomically designed to provide the radiographer with lighter, smoother movement for faster, more efficient workflow. It can also perform a variety of examinations using the upright stand, which has a wider range of vertical travel and allows exposures to be carried out from the cervical spine to the lower extremities. 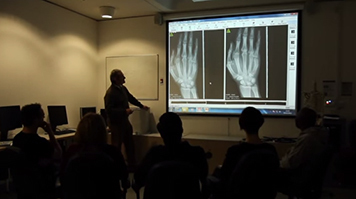 "They were happy to offer their expertise to our students and support our vision of continuous professional development (CPD) activities as well as ongoing training and support in the use of their equipment," concluded Mark Gradwell, Principal Lecture and Professional Lead for Diagnostic Radiography. The Digital Diagnostic Imaging Skills Laboratory permits Diagnostic Radiography students to practise their skills in a realistic environment. "These new facilities enable London South Bank University to offer radiography students the best possible learning facilities and will add significant value to their practical learning experience." With the use of this facility available, the Diagnostic Radiography course is able to provide an all-encompassing experience that, on completion, enables graduates to apply for registration with the Health and Care Professionals Council (HCPC) as a diagnostic radiographer. This is a requirement for practice in the UK, where radiography remains a dynamic and developing profession at the technological forefront of the fast-changing healthcare environment.